From the bestselling author of The Tuscan Child comes a beautiful and heart-rending novel of a woman’s love and sacrifice during the First World War. As the Great War continues to take its toll, headstrong twenty-one-year-old Emily Bryce is determined to contribute to the war effort. She is convinced by a cheeky and handsome Australian pilot that she can do more, and it is not long before she falls in love with him and accepts his proposal of marriage. The Victory Garden is yet another wonderful historical fiction novel from Rhys Bowen. It will appeal to fans of Land Girls as it follows Emily Bryce joining the Women's Land Army to assist in the war effort against the wishes of her parents. After falling in love with a pilot, Emily knows it is time to start living her life apart from the fears of her parents. Though her choices do not turn out like she expected, and she finds herself alone and with child, Emily decides that life must go on. She owes it to the man she fell in love with to survive and create a life for herself and their unborn child. Emily's journey is inspiring and touched by a little mystery. She meets people who influence her actions and support her decisions, but ultimately help her transition into a thriving independent life. I loved how Rhys Bowen captured Emily's voice as she stands against her parents to fulfill what she believes is a higher calling. I felt invigorated as she fought to make her own way and saddened by her loss. The Victory Garden is one of those stories that stay with you long after reading because you wonder how the characters fare until the end of their days. The loss of their unique voices and compelling stories lingers long after the end of the story. 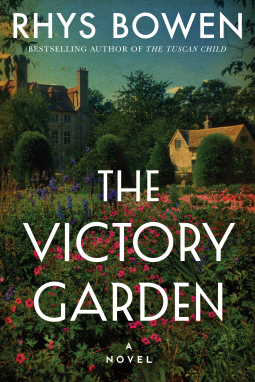 If you enjoyed Bowen's previous works, In Farleigh Field in particular, then you will no doubt enjoy The Victory Garden!